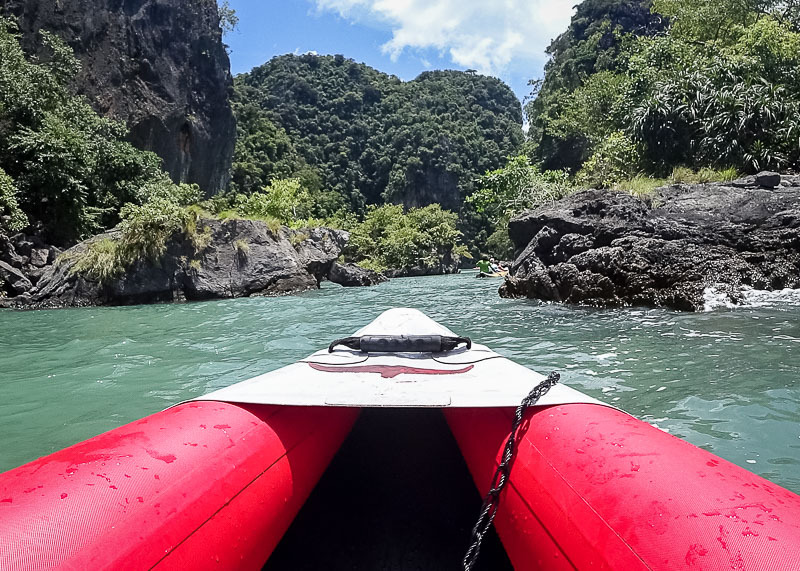 Phuket James Bond Island Tour by speedboat was incredible! After a nauseating few days of deciding which Phuket tour to do, we finally chose the James Bond Tour. Yes, that’s the James Bond Island tour where the 1974 movie was filmed. 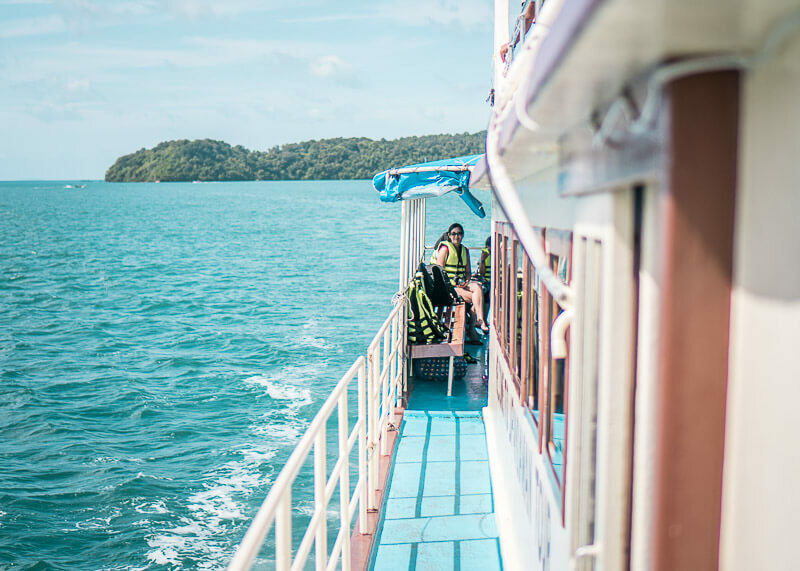 We heard it was ultra-touristy, but we still wanted to try it out and do some island hopping. 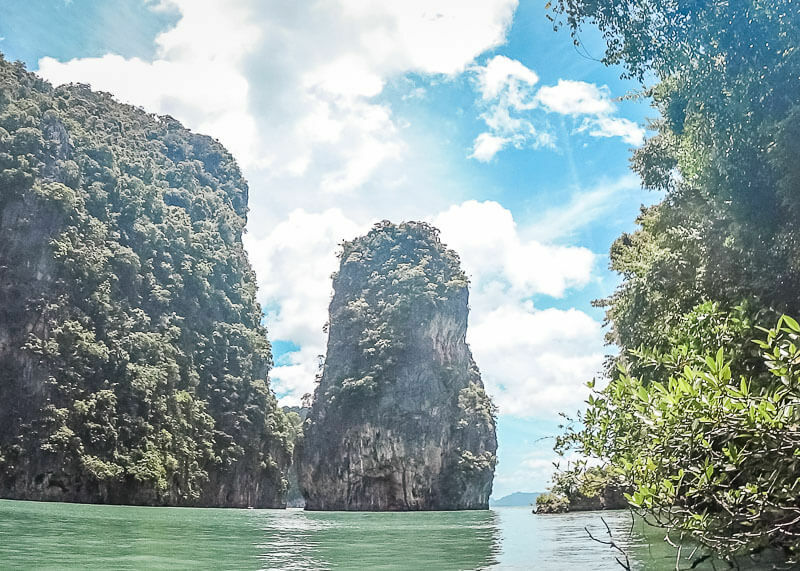 This post is for you if you are trying to decide amongst which tour company to choose and if the James Bond Island Tour is for you. If you’re new to the website and want to follow my year of travelling, visit this section for all my posts related to long-term travel. You can also start from the beginning of the series by reading this article. Here’s a short summary about me leaving Canada for a year to travel. 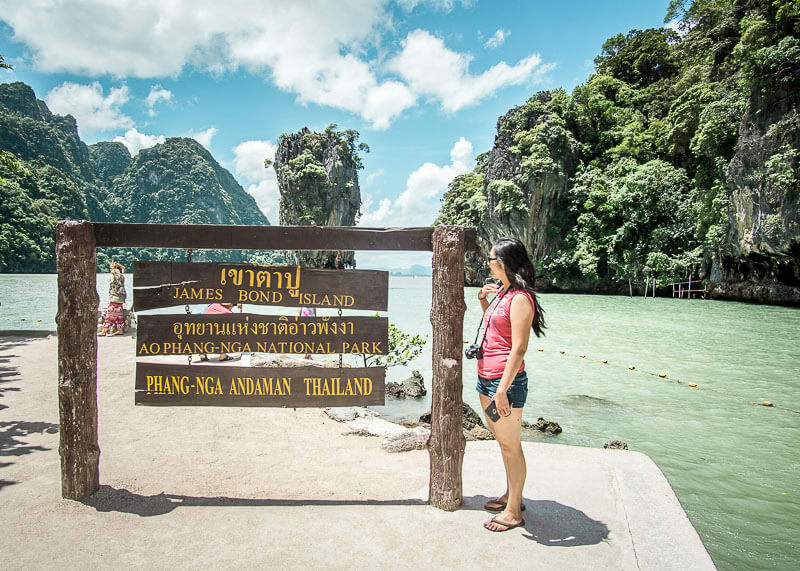 What Company did we choose to do the James Bond Island Tour? 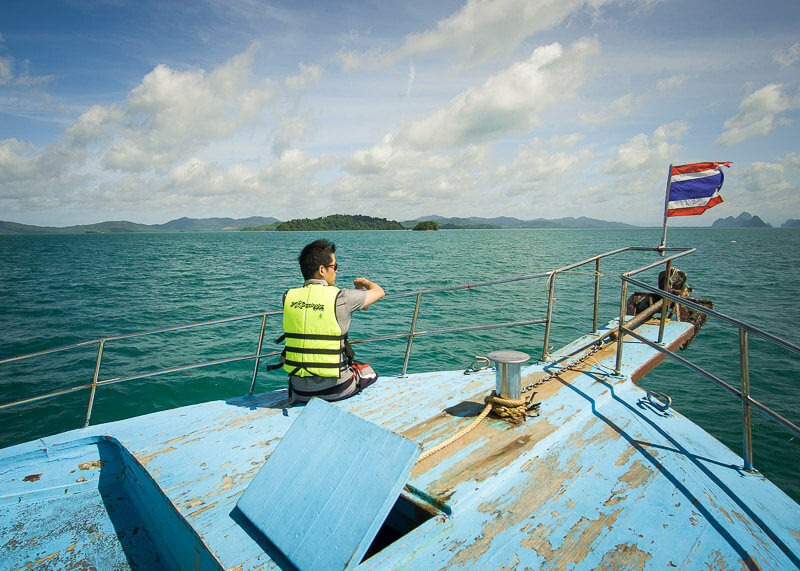 We decided to go with JP Andaman after doing some research about the different Phuket tour companies. This company has been around since 1999 and has served more than 60,000 customers. Most importantly, safety is a priority for them which was super important to us. Some companies will not cancel the tours if the weather is bad, putting people’s lives in danger! Yup, if you ever read about boats sinking in Thailand, the weather is one of the causes. 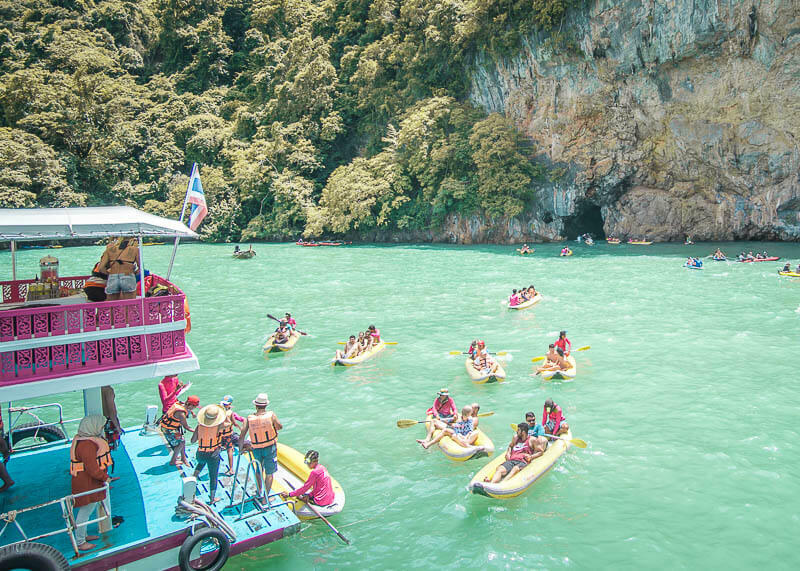 Since we were in Phuket during its rainy season, we wanted to make sure that the tour doesn’t depart when the sea will spin boats like clothes in the washing machine. 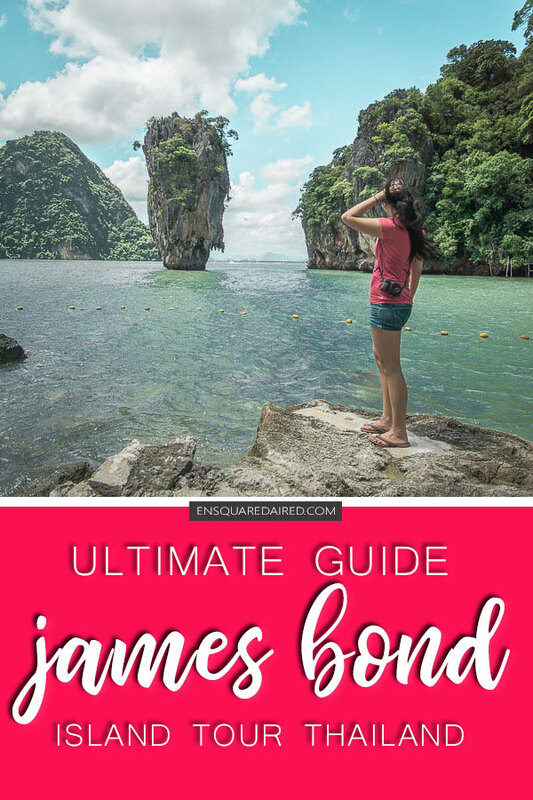 How much did it cost and what does the Phuket James Bond Island Tour include? Our tour was 2,700 baht for two people or 1,350 per person (about CAD 105 or USD 81 for two) which we booked with a travel kiosk that was in our hotel. Because we used our visa card, we paid an extra 81 baht for the 3% fee. We could have saved more money (about 100-200 baht per person) by booking with a travel kiosk on the street or online through Klook. But, we decided against it because it would be a hassle if something were to go wrong. 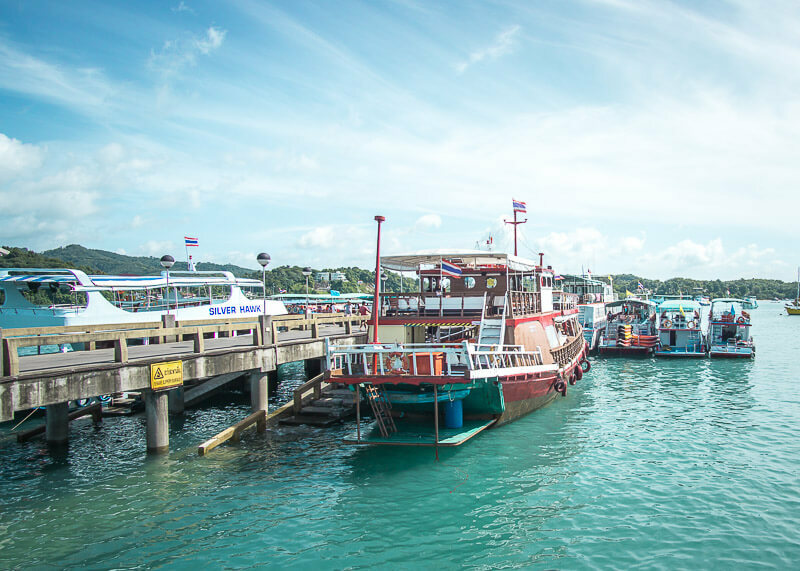 Read this post to learn more about what could go wrong, and what you need to know before booking your Phuket tour. 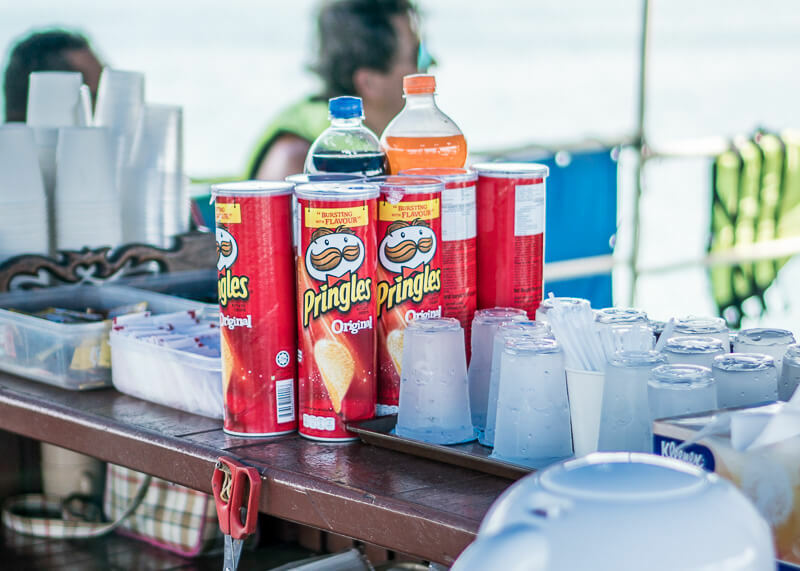 Pringles for sale on our tour boat! 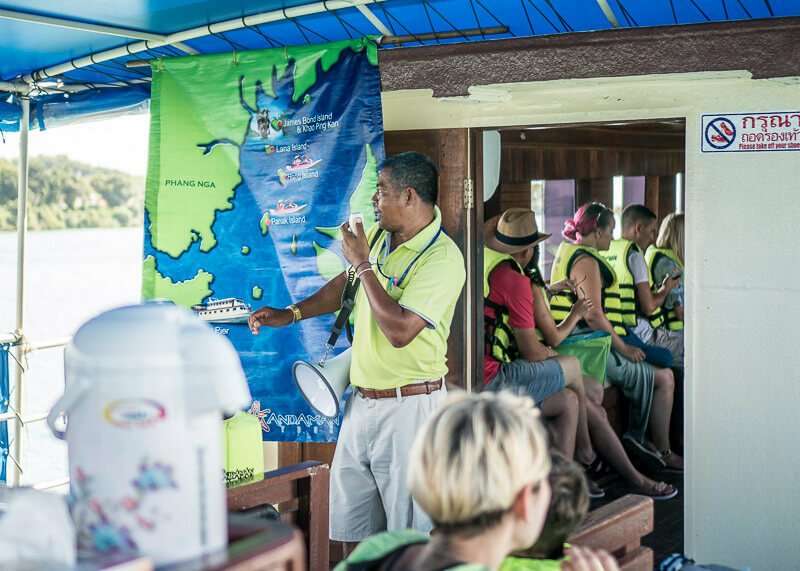 Out of pocket costs include tips, snacks for sale on the boat, and souvenirs. I’ve read online that some people paid twice the amount for their tours! It’s because they didn’t do their research! Don’t be like these people – save money, do your research! 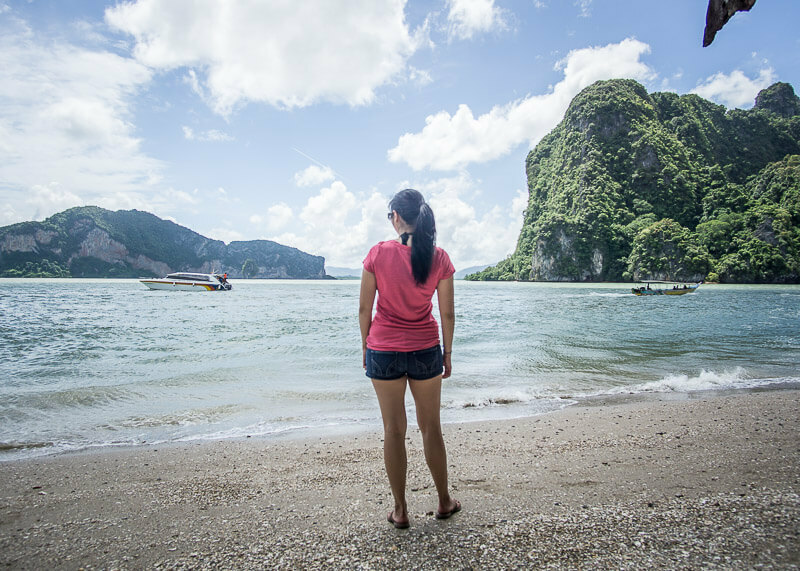 What was the listed itinerary for the Phuket James Bond Island Tour? Pickup from the hotel was straightforward and easy. We are so glad we booked the tour from our hotel. Siriwan made sure that we got in the right minibus and kept us up-to-date when the bus was late picking us up. The drive to Ao Po Pier is about an hour, and I passed out big time. Unlike the crazy drivers we’ve read about online, our minibus driver drove like a reasonable person. While the bus was full of people, the ride was comfortable, and the bus was clean and odour free. Yep, I have to mention odour thanks to the many bus rides I’ve been on where I wanted to throw up. Some buses either reeked of cigarette smell or they smelled like damp, dirty laundry. Add in stale air from the A/C, and you’ll feel like you’re trapped under someone’s armpit. This day could not be more dreadful; I didn’t sleep thanks to my inconsiderate neighbours and because I felt like a burned a hole in my stomach. As a result, I was super weak from the lack of sleep and the burned stomach lining. Once the minibus dropped us off at the pier, we joined a ton of confused and lost people. Luckily the tour company was super organized and quickly put us into groups to go on different boats. A tour guide came by, found our names on his list and gave us blue yarn to wear as bracelets. We were then transferred by a trolley from the pier and to our boat. This part of the tour was hectic, as there were hundreds of people waiting to board different ships. These are the moments where you’ll want to pay attention and not lose your guide. Note: I read online that some tours asked people to pay for the transfer to the boat. Our trip included this transfer, and I did not see many people paying for the ride to the boats. Once we got to the dock, we walked through three boats before arriving at our speedboat. It was a bit of a struggle walking from one boat to the next, and I’m happy to say I didn’t fall in the water. Tip before you go: Remember the face of your minibus driver so that you’ll know which bus to take to get back to your hotel! We forgot who our minibus driver was and spent 10 minutes looking for him! You will have to find your own transportation to get back to your hotel if you miss your ride! There were about 40 people in total on our speedboat, and we were divided between Russian speakers and English speakers. The Russians had their own guide and stayed inside the boat while everyone else sat outside. Our English-speaking guide first went through the rules and safety expectations. He made everyone grab a lifejacket and asked that we keep it on throughout the ride. “This is Thailand; you are the only one responsible for your own safety,” he said. I couldn’t agree more. Panak island is the first island that we visited for this excursion. The area is famous for their beautiful caves, lagoons, and stalactites. While there are monkeys in the area, we didn’t see any. Once we got to Panak Island, we hopped out of our speedboat and got into canoes to explore the caves. Each canoe had about two to three people, and each canoe had a staff member to do the rowing for us! 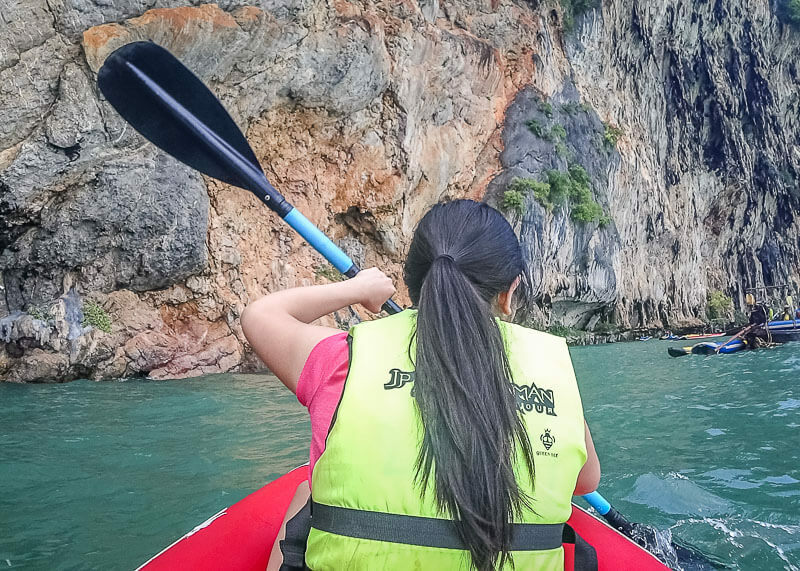 In hindsight, it probably is a good idea that we didn’t canoe because maneuvering through the caves would have been a struggle. Although some parts of the cave were so low that my nose was just inches away from the cave ceiling, despite lying on my back. We saw quite a few bats, which my tour guide would eagerly shine with his flashlight. I couldn’t help but think about how we were stressing the bats with lights. We learned that shining flashlights on bats was a big no-no during our Batu Caves tour in Kuala Lumpur. It stresses them out big time, and they’ll poo on you! While I didn’t get pooed on by bats, I did find some bat droppings just inches away from my feet in the boat. Tip: Make sure you don’t look up if you’re under the bats and it’s probably a bad time to talk during the cave tour. Side note: I did get pooed on by bats in Angkor Wat. Hong Island means room island in English and is visible from Thailand’s mainland. This island is a speck compared to Phuket, but it is not very busy, which makes it unique. 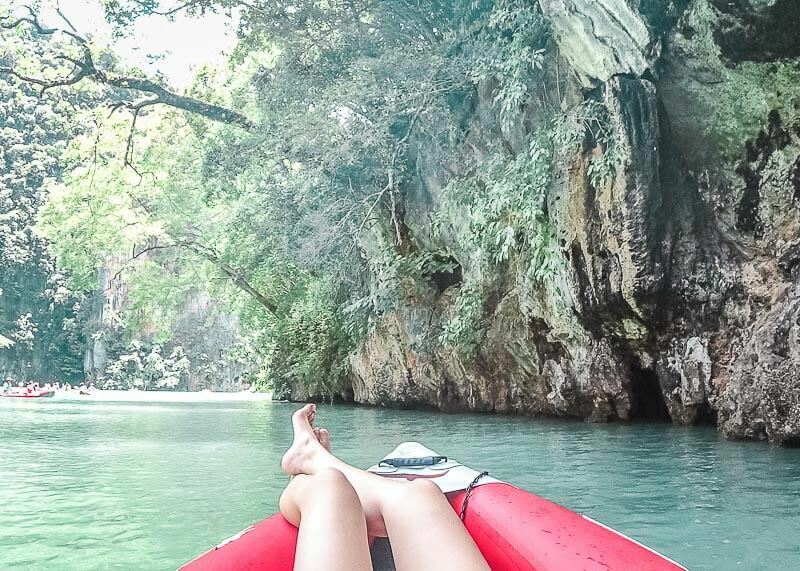 We did some more canoeing on Hong Island, and it was gorgeous to explore. Very remote, with clusters of small islands near each other. I can’t comment on the meal because I had three bites of plain rice. I was so sick that the smell of food made me want to vomit. Yup, that ill. What a perfect day to spend a day in the sun. 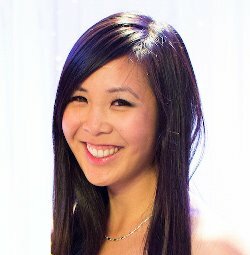 Illness doesn’t take a sick day, said wisely from this article. Also, note to self – Don’t ever eat a massive bowl of spicy noodle soup before a big excursion. The spread was quite impressive too. The lunch included fish, noodles, fried rice, vegetables, soup, salad, and chicken. I think this part of the itinerary happened before we went to James Bond island. We did stop in the middle of the sea at some point for the swimmers to get off the boat and swim. Gary looked like he was having a good time. He did comment that the water was not crystal clear because it was muddy, but the water temperature was perfect for swimming. I’ve read reviews online that James Bond Island is not worth visiting, but I still enjoyed it. While crowded, we still managed to get some decent photos. It was fun to explore the island and try to imagine what James Bond did in his 1974’s movie. This island was unheard of and rarely visited before the 1974 movie. 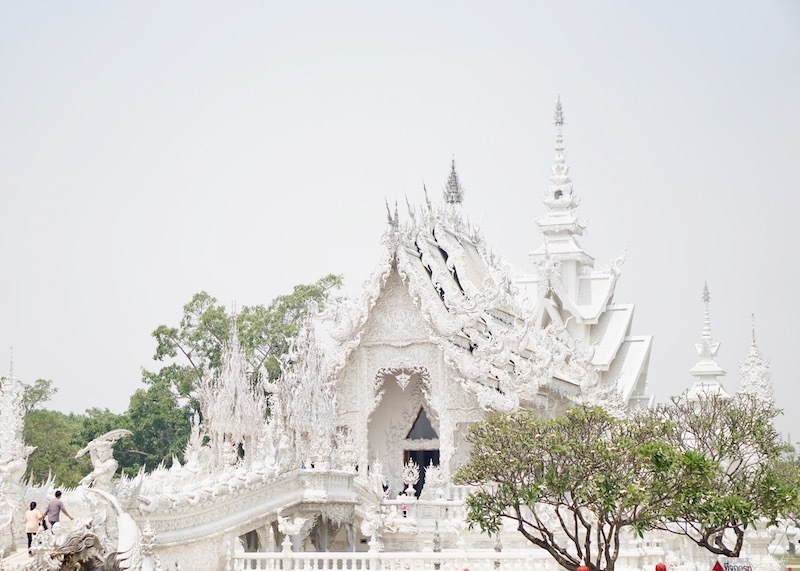 But thanks to the film, this landmark is now ultra-popular and touristy. I suspect the same thing will happen to Ninh Binh thanks to the new King Kong movie. 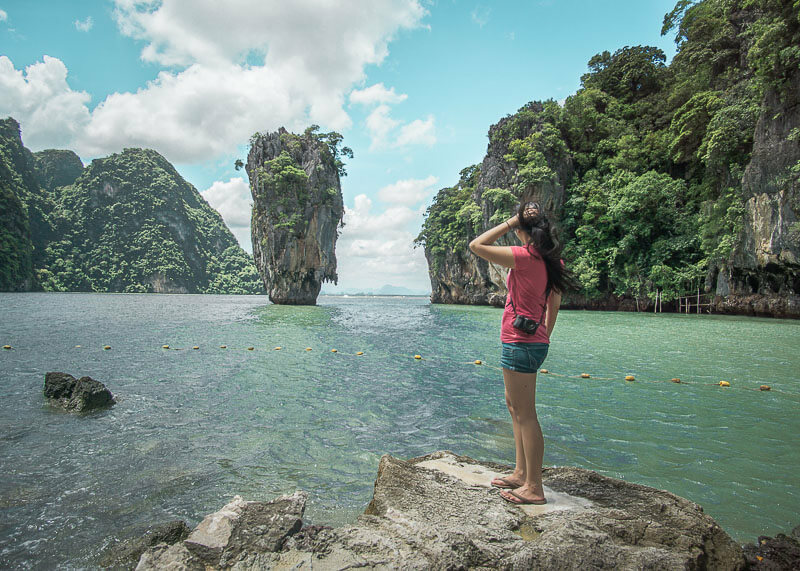 While the James Bond Island’s real name is Ko Ta Pu, locals and foreigners rarely use the island’s real name. 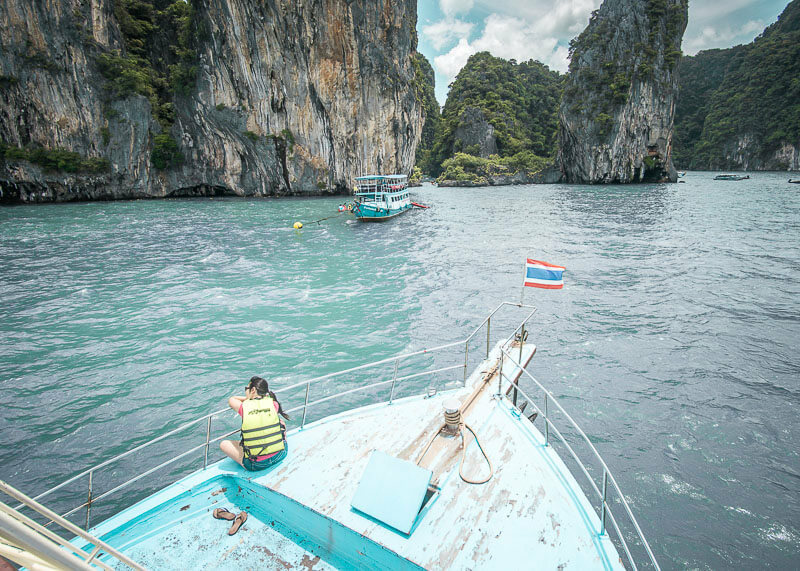 Once the speedboat was close to the island, we transferred on a long tail boat for a short ride to the James Bond Island. 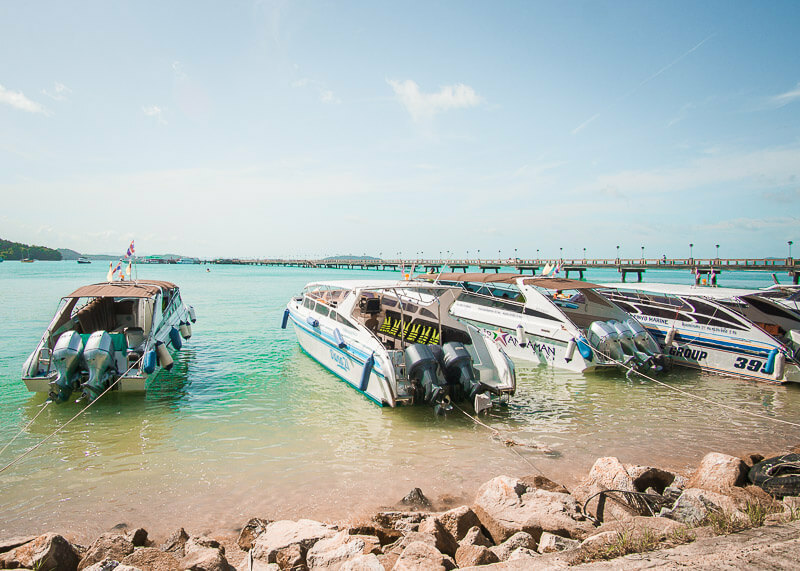 Thailand has forbidden tour boats to get close to the island to prevent erosion of the limestone rocks. Erosion will cause the island to collapse, which would not be cool. We had 40 minutes to explore the small island, which felt like a reasonable timeframe. There’s not much to do or see on the island, aside from a few caves to explore. Once we got back to our boat, it was time to head back to the Ao Por Pier. 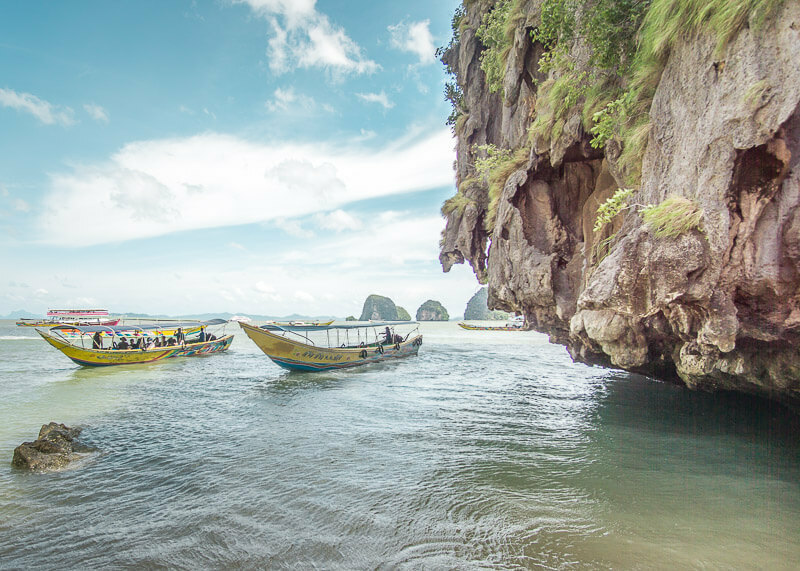 It would take about two hours to get back to the pier from James Bond island. The pier has a bathroom for 10baht per person, and the boat had washrooms too. 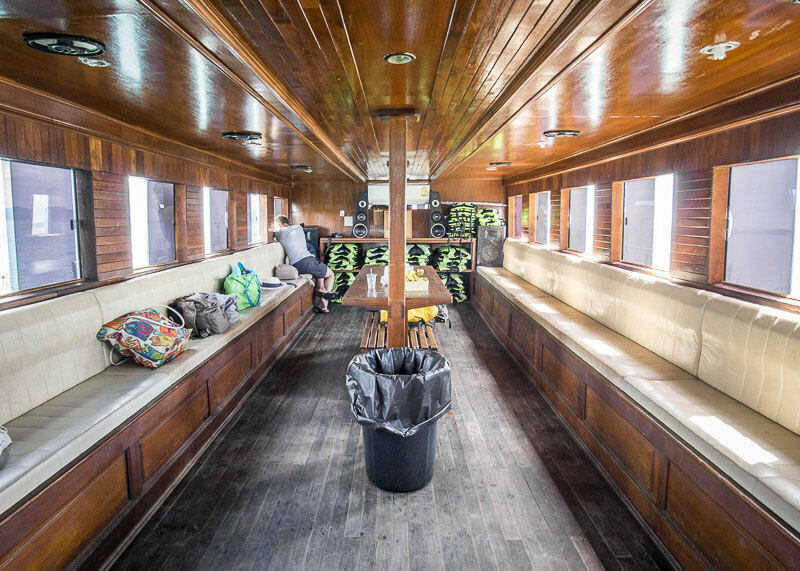 The restroom on the boat was surprisingly clean, and it had toilet paper! Some of the guides and rowers kept blatantly asking for tips, which was annoying. They weren’t pushy about it, but they kept asking for it. They’d ask where we are from, and then ask us for tips. I’m all for tipping when it’s good service, but when it’s solicited like that, it’s frustrating. But again, this was minor in the grand scheme of things. 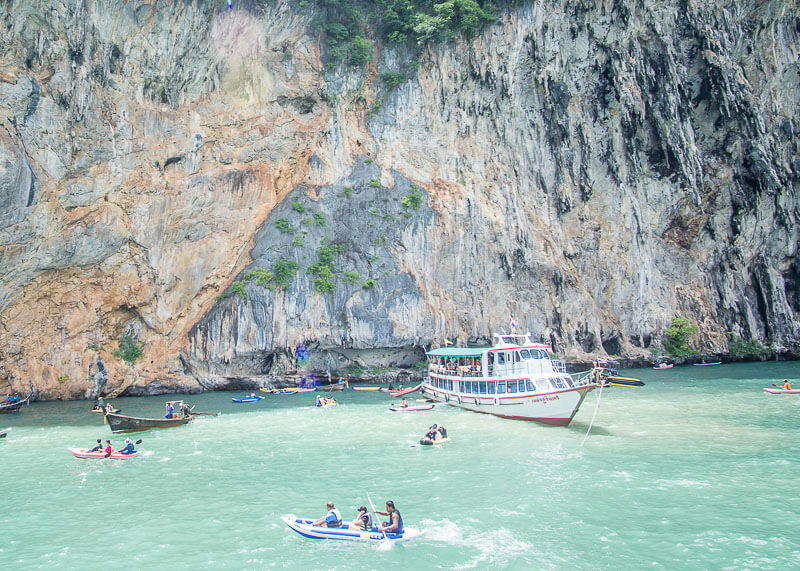 Would I recommend the Phuket James Bond Island Tour? We were pretty happy with this trip and felt we got a lot of value for the price we paid. 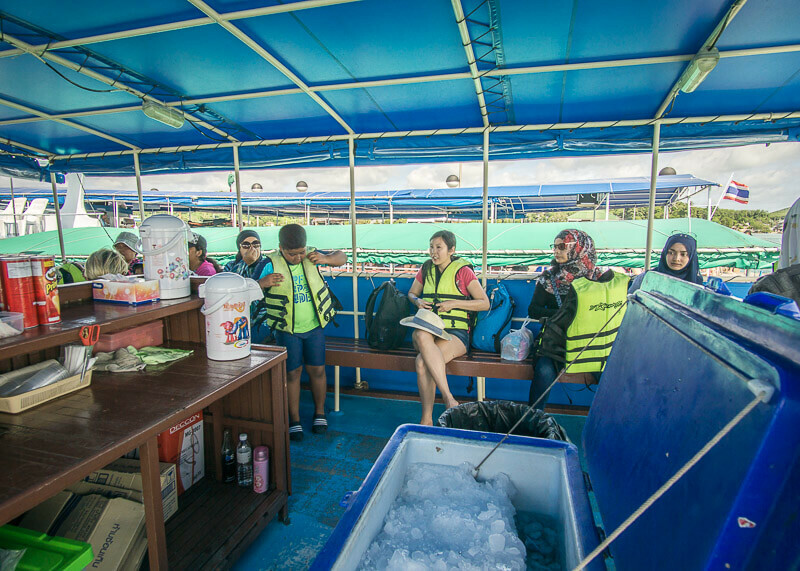 Most of all, it was safe and organized, and most of the tour operators were professional. The James Bond island is on my bucket list for a while and I really hope to cross it off soon, Nancy. Your post was very inspiring and informative. Is a day trip to this island enough to see all the highlights there? 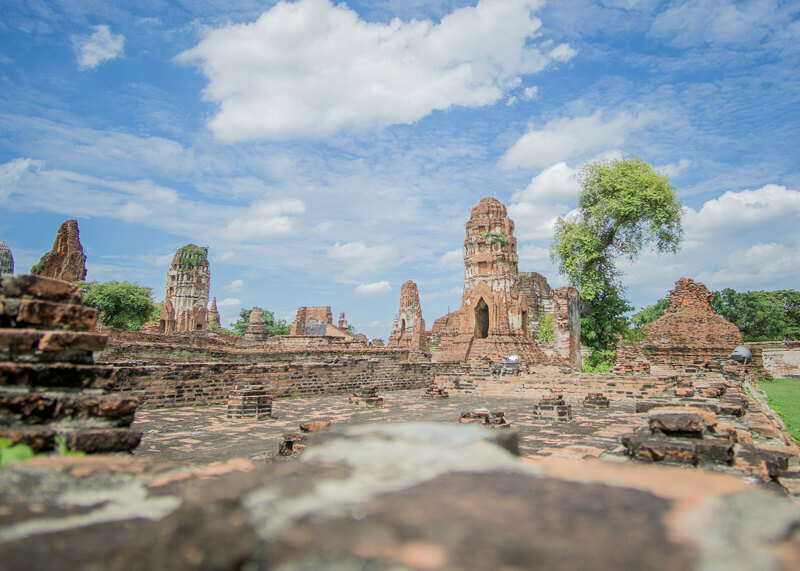 Man… we were just talking about going back to Thailand and spend more time to explore. You’re making it hard to resist. OMG so tempting. If we didn’t already have a few trips planned and run out of vacation time, we would definitely make a trek back here. Your comment about the odor is hilarious! Live like a local, yo! Well, the best way is to be the odor yourself then you’d blend in with everything. LOL. LOL, but it’s true in some of the other countries I’ve visited during my travels! OMG this is one of my favorite places on the planet. 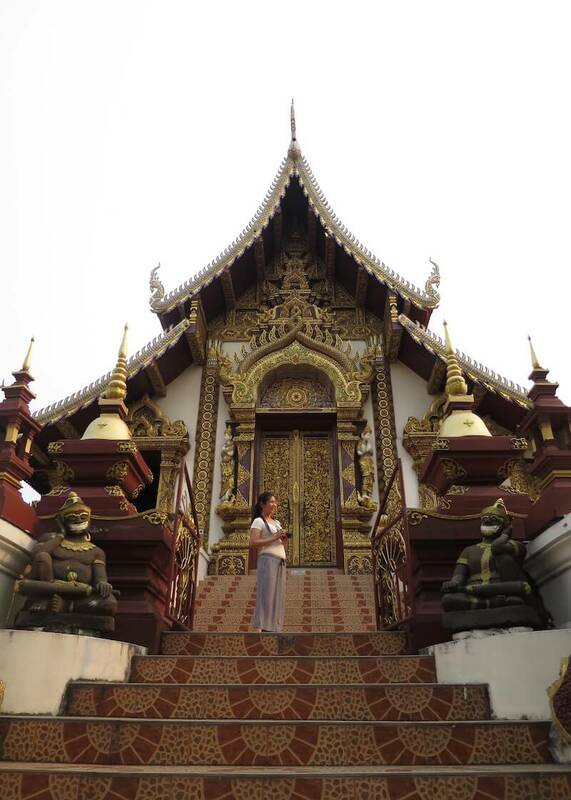 Hubby and I spent a week in Phuket and Phi Phi and plan on going back as soon as possible!!!! We didn’t do the James Bond Tour but I’m thinking we will next time! Thank you for your post! 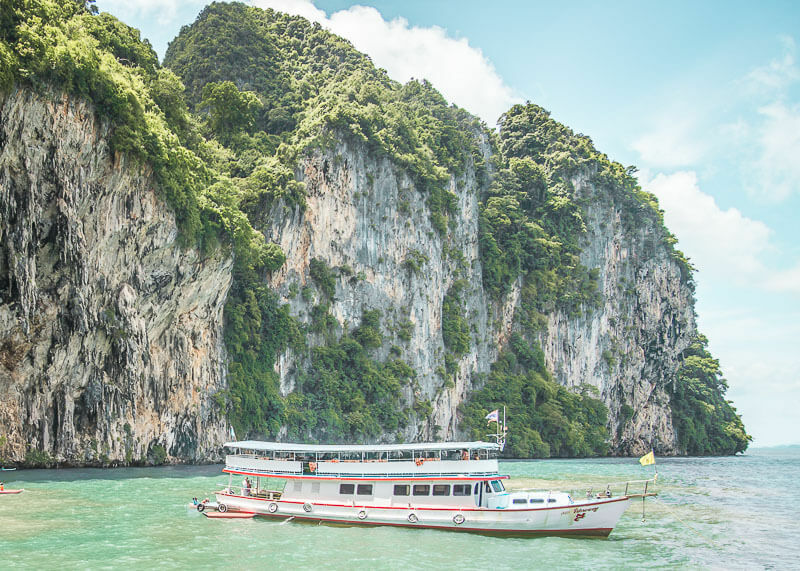 Did you happen to visit the Phi Phi Islands? Also, is that link for Klook where you booked the James Bond Tour?